One of my clients during the time I ran my foundry in Fort Collins Co. was a wonderful artist named Cindy Wolf. Cindy and I collaborated for seven years during the early part of her career and she always demanded perfection in her work. I did this piece as a result of her influence and after visiting her studio in Versailles Kentucky. We shared many experiences within the environment of the horse industry. Cindy is a world champion horse trainer and show ring competitor and loved the Saddlebred. In 1986 she had just retired her horse and it was so high spirited and retained so much of its training that for years it didn't know it was a horse when it was in the company of other horses. This sculpture is my attempt to show just such an animal. The equipment laid at the base of the sculpture is symbolic of turning the horse out to its retirement, however the horse has not forgotten its training. 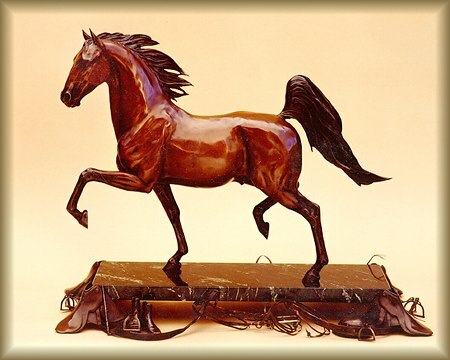 Cindy and I also collaborated to create the Challenge Trophy for the American Horse Show Three-Year-Old Five gated Stake which now resides in the Kentucky State Horse Park. To place an order contact us at Inquiries02@artsales.com and an individual sales representative will contact you to assist with the transaction.